Evil trolls have stolen the treasure of the ancestors and the magical tribal amulet; now the Kaskarians fear the wrath of their ancestors. Brave heroes immediately set off with flying scaled griffins and fast cliff runners to reach the trolls' lair which lies at the bottom of the volcanic crater. 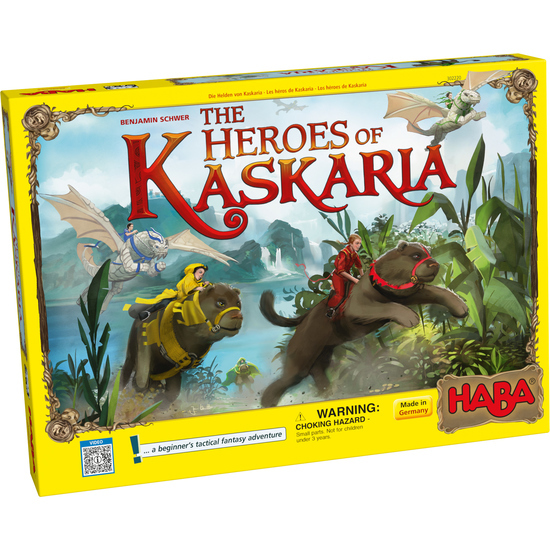 The hero who plays their action cards cleverly, rescues as much treasure as possible, and snatches the magic amulet back from the evil trolls will become the big hero of Kaskaria! Contents: 1 game board, 4 scaled griffins, 4 cliff runners, 55 playing cards, 80 pieces of gold, 1 magic amulet, 1 set of instructions.